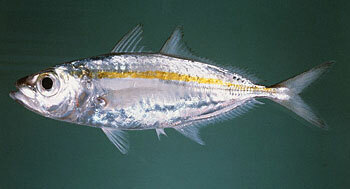 The bigeye scad is found in clear oceanic tropical waters worldwide. Occurring in schools as large as hundreds of thousands of individuals, it is a highly commercial species. The life of a bigeye scad is brief. Fish may mature by seven months and live only two years. Spawning has been reported to occur at night during April through September in Hawaii. As a fast growing, short lived species bigeye scad are highly fecund.Rasping sounds emitted from individuals are commonly observed during capture. These sounds are produced by grinding of the pharyngeal teeth. Enormous schools may collectively produce low-frequency hydrodynamic sounds while swimming.